Chances are you’ve come across an ad for a product promising to reduce your stress while scrolling through social media. Makes sense, given that 8 in 10 Americans consider themselves stressed and 40 percent of us reported being more stressed last year than the year before. But even in our desperately-seeking-zen culture, a recent Instagram post by the millennial-focused health brand hers invoked the internet’s ire for marketing propranolol — a medication used by doctors to treat high blood pressure and severe panic attacks — for the off-label use of treating everyday anxiety and pre-date jitters. Hers is far from the only company to try and sell us quick fixes to calm us down. 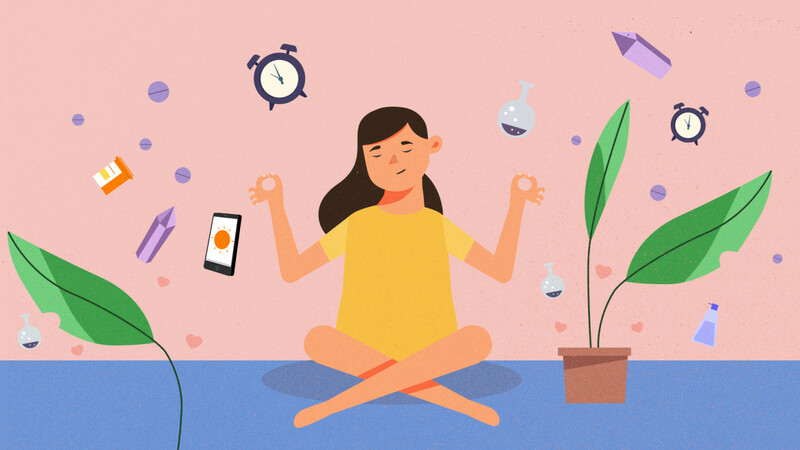 As Eva Wiseman recently wrote in The Guardian, we are in the midst of a surging anxiety economy, where we’re being marketed — and told we need — a steady stream of products and services purported to help reduce our stress, starting from the moment we turn on a meditation app in the morning to the time we pop a melatonin pill before bed. In effect, we have become “calmnivores:” a term Thrive Global is coining to describe how we’re perpetually seeking and consuming anything that promises us less stress and more calm. But with so much on offer, it’s becoming harder to separate the truly useful from the pointless — and the potentially harmful. And as we wade deeper into a sea of products and services that claim to allay our stress, we’re turning our focus further away from its root causes. How did finding calm become so stressful? Welcome to the calmnivore’s dilemma. On the surface, this newfound attention to living calm, focused lives looks like a good thing. For so long, high levels of stress were inextricably linked to the perception of success: The more stressed you appeared, the more successful you must be. Somehow, the onus to demonstrate that we’re living our best lives has become a source of stress in itself. If this sounds completely counterintuitive, that’s because it is. Our societal quest for calm is coupled with a health care system that leaves many people out and is largely reactive, rather than focusing on caring for the well-being of a whole person and going upstream to address the causes of our suffering. The result is many of us attempting to take matters into our own hands, trying anything that has the potential to make us feel better and more centered. Beyond the fact that it’s daunting to sift through the noise to find something that works, a larger problem is that not all these options are created equal. Some are silly, like stickers that promise stress relief, or crystals to heal your anxiety. Others — like the long-term use of melatonin as a sleep aid, or taking CBD products to relieve stress and anxiety — haven’t yet been the subjects of sufficient research to prove their safety and/or efficacy. Some — like hers advertising the use of serious medication to help combat nervousness associated with dating — are flat-out dangerous. And yet, there are other trendy calming treatments that can and do work for some people, including weighted blankets (which work by way of deep touch pressure therapy, which stimulates the sympathetic nervous system to tamp down a fight-or-flight response and bring on a relaxation response, much like a bear hug), meditation apps (which have introduced the masses to an ancient mindfulness practice), and acupuncture, which people swear by for benefits that range from lessened pain to increased calm. I will be the first to admit that I am, in fact, a calmnivore. I appreciate all the options for dealing with anxiety, but, like many of my kind, I quickly became overwhelmed by all of the products, services, and apps out there aimed at making me calm. I love science- and evidence-based treatments as much as the next rational person, but when you’re having an anxiety attack in an office, as I did years ago, and someone hands you an envelope to breathe into in the hopes of calming you down, you open your mind to other tactics. I’ve spent hours gently, consensually crushed under my weighted blanket. I’ve dropped various forms of CBD oil under my tongue at 3 a.m. when I’ve tried to get back to sleep after a night terror. I’ve spent flights dutifully filling the pages of anxiety workbooks and adult coloring books. I’ve spritzed my pillow with lavender essential oil after showering with lavender soap and slathering on lavender lotion, in an attempt to trick my body into thinking it was falling asleep in Provence. And yes, I’ve breathed deeply into office supplies. The thing about anxiety — or at least mine — is that it’s cyclical. One of my greatest skills is making my own anxiety worse because of something I was doing to help treat my anxiety. This is certainly the case with the barrage of products marketed to us now, promising to make us calm. After a while, I became anxious that I was doing something wrong — or not enough to treat my anxiety. I took a breath and a step back, talked to my therapist, and refocused on strategies that actually work. The good news is that beyond the fads and hype, there are actually plenty of science-backed ways to treat anxiety that we know work and are safe. The realistic news is that there are no quick fixes that will rid you of anxiety simply by popping a pill or rubbing a crystal. Instead, like most other meaningful behavioral shifts, treating anxiety happens through a series of incremental changes — also known as Microsteps — starting with addressing the cause. In his work as a clinical psychologist, Adam L. Fried, Ph.D., an assistant professor of psychology at Midwestern University who also has a private practice in Phoenix, has found that people who experience anxiety are often worried about the future and other things outside of their control — part of which can include their anxiety itself. A common but ineffective way many people deal with anxiety is by avoiding it, Kelly Moore, Psy. D., a clinical psychologist practicing in New Jersey and specializing in anxiety tells Thrive Global. “Anxiety thrives in people who opt to avoid the things that make them anxious. The most tried and true, research-supported way to deal with anxiety is to approach rather than avoid situations that provoke anxiety — specifically if those situations are ones that we have to encounter if we want to enjoy our lives,” she explains. In short, implementing realistic daily practices that both reduce your anxiety and improve your overall well-being, says Fried. These often center around personal health habits, like introducing meditation, concentrating on good sleep habits, eating well, and exercising. “As they make these behavioral changes, people begin to gain a sense of self-efficacy and appreciate that there are things that they can do that can influence their anxiety levels and produce positive emotional and physical benefits,” he tells Thrive Global. Another underrated trick to managing anxiety? Limiting your caffeine intake, says Dion Metzger, M.D., a psychiatrist practicing in Atlanta. While it can be tempting to grab that second (or third) cup of coffee to give us the boost we think we need to make it through the day, in reality, too much caffeine can trigger panic attacks and lead to other anxiety symptoms like a racing heart and sweating, Metzger tells Thrive Global. And we can’t ignore our unhealthy relationship with technology and constant need for connectivity, and the impact it has on our stress levels. It’s not realistic to expect everyone to ditch their phones — nor should we — but this is another area where taking a few Microsteps towards having a more sustainable relationship with our devices can make a big difference. For example, stop using screens a half hour before going to bed. And don’t underestimate the benefits of removing your phone from your bedroom before going to sleep; not only will it prevent you from checking it during the night, but it also means that it won’t be the first thing you look at when you open your eyes in the morning (and it shouldn’t be, as this results in an unwelcome and unnecessary cortisol spike). Having a supportive community — including your colleagues — can go a long way to help with stress and reduce burnout, too. When our lives are devoid of meaningful interpersonal relationships, we’re more likely to feel the effects of the stresses in our lives. Ultimately, what works to keep us centered, engaged, and less stressed are tactics that have always served this purpose. And thankfully, very tiny steps, not giant life overhauls or gimmicky products, can get us there. It comes down to feeling a sense of control over our lives, connection to our communities, and having the space to just breathe — things you probably won’t see on an Instagram ad.